Embroidered towels are quick and simple gifts for just about anyone – who doesn’t need more towels? – particularly when monogrammed with the recipient’s initials. But stitching can be problematic – stitches fall between the loops of the fabric and disappear, or the stitched designs crumple and distort when the towel is laundered. Not good! But these problems are easily avoided by using the correct stabilizers and techniques, as demonstrated by Kay Hickman in this Tool Tips video. 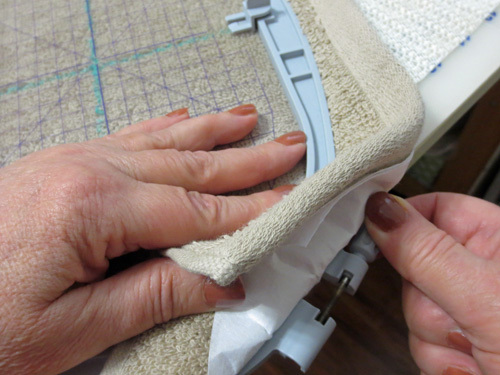 She also shows how to “hoop” towels which are too thick to secure in an embroidery hoop. Enjoy this “Hooping for the Best” video from BERNINA of America! Note: These tips are also helpful for applique.